This is an issue that not just apartment complexes, but also many employers across the country deal with on a daily basis, parking enforcement. For many residents and employees, parking can be a premium benefit to the complex they live in or the company that they work for. When that benefit is taken away from them by an outsider, it can create frustration for them and headaches for you, the property manager. 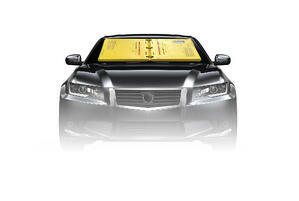 Luckily, there are two parking enforcement solutions offered by Signal 88 Security's mobile patrol model. Signal 88 Security's mobile patrol allows our locally-owned franchises to implement parking enforcement solutions such as The Barnacle. This device is designed with all people in mind, making parking enforcement safer, greener, more efficient, and less aggravating for everyone. In coordination with the property, we'll first take the time to understand your parking enforcement rules and regulations. Once we have a basic understanding of those items is when we'll develop a plan for who and when to implement The Barnacle. With over 700 pounds of force, The Barnacle is placed on the windshield of the vehicle in violation, blocking the driver's view and preventing them from taking the device off and driving away. The driver of the vehicle will be provided directions on The Barnacle of how to pay the parking violation fine and remove the device from their car. This process eliminates the need for getting messy with towing companies and headaches for you. 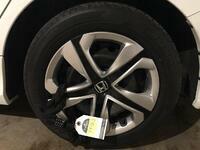 A second solution for your parking enforcement needs is the newly developed, The Tire Tag. While smaller in size than The Barnacle, its effectiveness in deterring parking violations is present. Once we're able to determine the proper plan to enforce your property's parking enforcement rules and regulations, we can implement The Tire Tag solution. 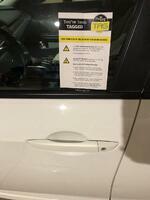 When a visitor or resident is in violation, The Tire Tag will be attached to the driver's rear wheel through a spoke and locked into place. Decals will then be attached to the driver's window providing next steps to removing the device. While this may not completely deter the driver from leaving the property, driving with The Tire Tag won't be a fun ride home. And by using The Tire Tag's mobile application, our Signal 88 officers will be able to enter the violators license plate information and pictures for appropriate documentation. Three out of four parking violators are repeat offenders. Through Signal 88 Security's parking enforcement solutions you can help prevent these violators from showing up on your property, giving your residents, employees and customers the peace of mind they deserve.